Mother’s favorite flower was a peony. Every spring when she was unable get down on her hands & knees any longer to scratch the earth with her digging fork and gently work into the early warmed rich black dirt of Northern Illinois the bone meal and other organic soil amendments that made her peony bushes spectacular she asked me to take care of the peonies first. Since I already loved to get to early spring plantings and of course pruning the roses many times I grudgingly approached this as a tedious chore. OK, truth be told I complained a lot. 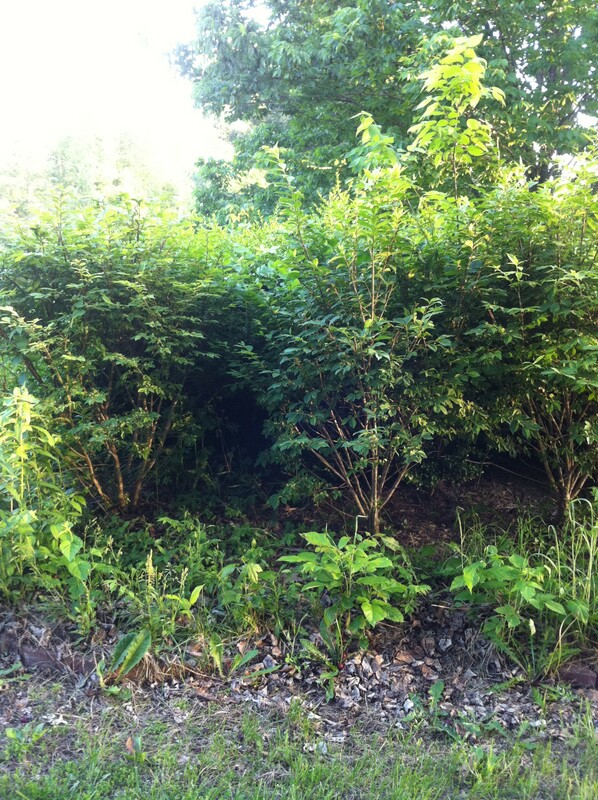 But I did it, and today I would give anything to have a stand of peonies to take care of for her. We used to visit and laugh and discuss the care and application of organic materials we would put down. She also knew things about peonies that other people didn’t and I imagine still don’t. How in the world did a West Texas girl ever learn so much about a flower that doesn’t even grow in West Texas? Reading I suppose. She read everything cover to cover. 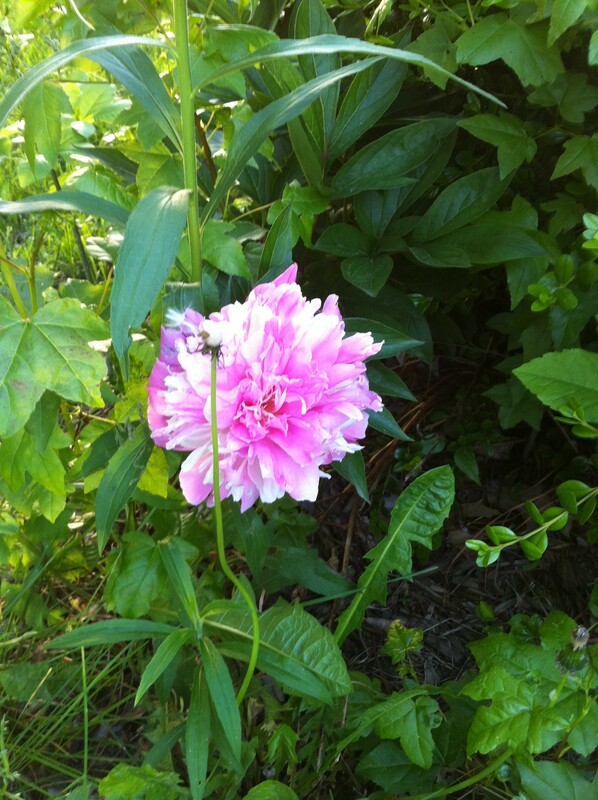 Last week-end I was in Illinois and talked incessantly about the peonies blooming. They are magnificent and everywhere. I especially noticed the white double peonies because white, my mother always said was the color of a corsage one wears when one’s mother has passed away on mother’s day. I told my husband how I wished I had peonies. Since both of us grew up in Illinois we have a house there and go back frequently. Taking care of the house was the purpose of our trip. My father, a World War II Veteran died when he was in his 50’s, and every Memorial Day my mother cut peonies and placed them on his grave in northern Illinois and that of his brother also a WWII veteran. On this Memorial Day I know that my sister-in-law in northern Wisconsin still visits my brothers grave and tells me flowers still rest on my father’s grave of those who remember his and my uncle’s sacrifice. While visiting the house in Illinois out of the blue a neighbor walked up while we were standing in the garage with clippers in her hand. 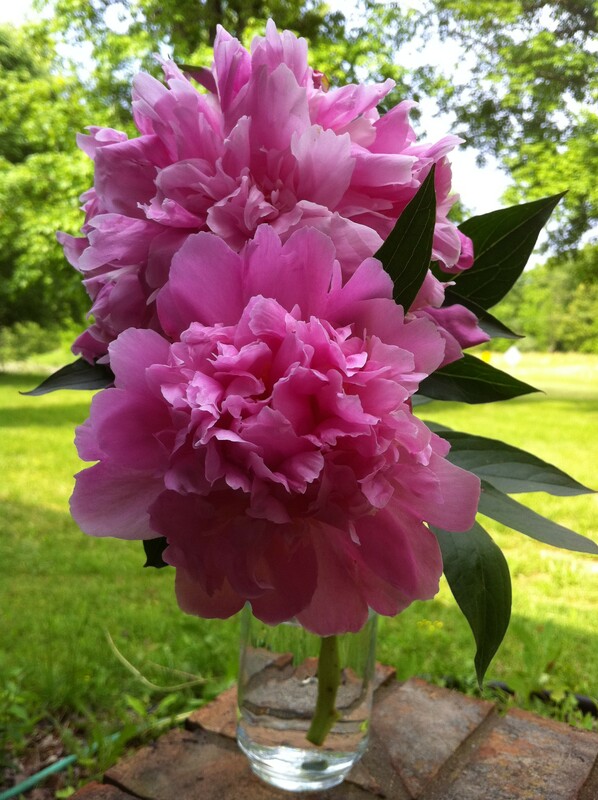 She and her husband had been out to supper and she said “may I have some of your peonies”? Stunned, I replied that if she could show me where I had any she was welcome to have them. She marched me down the hill to a secret garden and there buried behind some overground plantings were some long forgotten peony bushes. I cannot tell you how divine in nature this revelation came across to me in light of the conversation all day but suffice it to be a bit more than a coincidence. My mother passed away on the Friday before Memorial Day in 1994. In her long battle with cancer she had asked to go to a skilled care facility just a couple of months before she died and as she walked into the living room one day I will never forget she said to me “do you miss me?” and it broke my heart so I said “no mom, it will be OK I will visit you, and come get you and see you all the time”. I miss her everyday. I miss her putting flowers on my father’s grave in northern Illinois. I want to thank my father for his supreme sacrifice for this country and all the other war dead. Beautiful story. Thanks for sharing it with us. Words cannot fully explain what a wonderful woman my mother was and the devotion she had to my father. I was so moved to find those peonies and I hope the emotion of that revelation came across. Comments are hard to write as I wipe my tears. I too miss your wonderful mother along with mine and our other mom, Aunt Theresa. May all be remembered and a smile cross your face with the memories or our past and future to come with them. Your mother, I believe was surely an angel on this earth. I remember how the children from her Sunday school classes openly sobbed at her memorial. She is missed by so many and she touched so many people’s lives as well as mine and our cousins. Thanks for a beautiful rememberance. 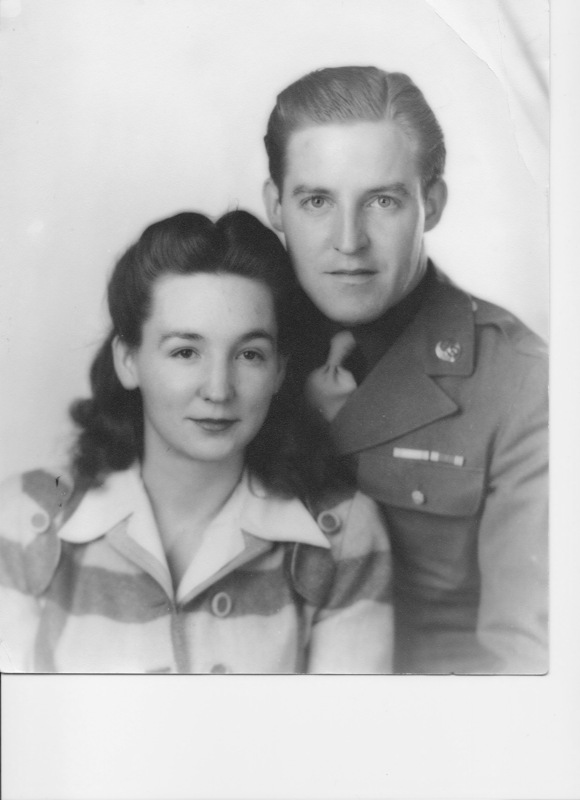 My father was WWII veteran and my parents were actively involved in veterans causes. My father also died in his 50’s, mom carried on the volunteer work until her death from cancer 3 years ago. She enthusiastically sold “Buddy Poppies”, small crimson paper flowers wired together, inspired by the poem “In Flanders Fields”. They truly were the greatest generation. Thank-you for sharing that your father too was a WWII vet. It is so important that we remember the ultimate sacrifice given by so many for us. The sermon Sunday was also poignantly phrased to remind us not to waste our Freedom. And then for your father to continue to serve others is a testament to his character as well. Dearest of the most dear Gagas, my mom has grown double pink peonies for as long as I can remember. They have always fascinated me and have always been a symbol of home for me. Just that fact alone really makes this post resonate, but your sharing of your memories, and tying those memories to flowers, is such a beautiful post and thought. Sending big hugs your way, my friend. It was seeing the pink peonies that made the anniversary of my mom’s death even more poignant. She was such a special woman in so many ways and she never forgot those that fought and died for our country including my father. The way in which this hidden garden and the peonies were revealed to me was such a mystery and I marvel at it. I love this entry in your blog. It is so touching, thank you so much for sharing it. Forgive me for this very late reply. Moving has been a transition that I am just now going to write about. Thank-you for keeping up with gagasgarden. There’s lots more to come. I hope you still laugh like me so I can remember how to do it, lol! Thank you for this wonderful tribute to your mom. As a child, I loved thinking I was her favorite but I know she made everyone feel that way. I enjoy picturing her and her sisters are nurturing a garden in heaven. Love you. My Mother, your Aunt Dorothy made each person that she loved feel they were the most special person on earth. And she made them know they could accomplish anything they wanted if they set their heart and mind to it in this life. What a legacy…The only other person who could fill her shoes was your Mom my Aunt Theresa. I just saw this beautiful message. Please forgive me for missing it and thank-you from the bottom of my heart. I loved this memorial to your mom and my cousin. Because of the difference in our ages and the distance between us, I really did not know her very well, but I have loved getting to know her daughter! And I do see her spirit in you! She came from very good stock, you know. I’m glad you are back home in Texas where she originated. You need to come out here to West Texas for a visit to your roots! I know that I saw that Calloway’s Nursery in Texas was selling a type of Texas peony hybrid but it really doesn’t look like a peony to me. You might try to buy one. Texas is just not the climate for peonies though. This last spring central Illinois had the most beautiful profusion of bloom for peonies I ever remember. Thank-you so much for including this post in your collection of Favorite Blog Posts of 2011. I am indeed honored. Your recognition inspires me and encourages me to reach inside to the source of better work, my heart. You have and will continue to be a beacon of knowledge to me. The best ever…..makes me cry every time I read it. What a blessing…. It’s so good to hear from you. Thank-you for this lovely comment. Please call. My favourite flower as well, and what a beautiful story and tribute. I do so appreciate your thoughtful comment. Thank-you for always being so supportive. I hope you have a lovely Memorial Day.